I would like to start off saying that we are not commercial dealers, we are collectors. 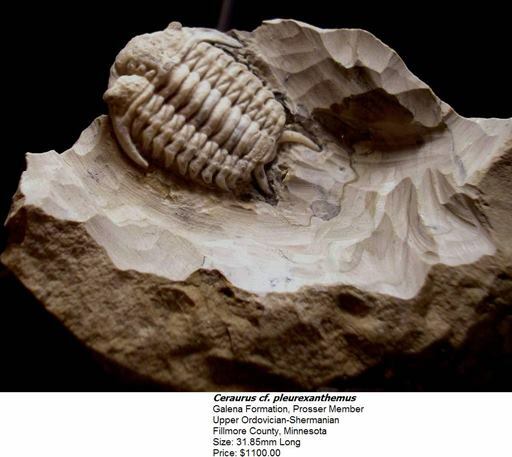 The purpose of this "For Sale" page is to make our hobby of collecting trilobites a little less burdensome to the wallet. Being field collectors everything we find is in "field condition". That means that everything is covered with some sort of matrix, may be broken in half, and in some cases just a baggie full of exoskeleton and small flakes from a specimen that did not come out ideal while collecting it. To turn these "diamonds in the rough" into nice display specimens requires specialized tools and someone who knows how to use them well. It also requires us to know our limitations and when to hire a professional to prepare some specimens. Presented here are trilobites offered for sale in order to facilitate the preparation of additional trilobites in the collection. Hopefully, our dilemma allows you the opportunity to acquire specimens for your own collections. All shipping charges are included in the listed price of the trilobite. All trilobites will be shipped via USPS fully insured to the purchased price with a tracking number. The preferred payment method is PayPal, but we can arrange other payment options if needed.